The difference between a recreational kayak and a touring kayak is something that perplexes many people who are new to the sport. Some think a recreational boat is just a cheap touring kayak. They might be right to some extent; touring kayaks are often more expensive since, in addition to being constructed of better materials, they also have more features. But price is not the only difference; recreational kayaks are designed for a different paddler than their touring counterparts. What’s important is that you choose the right kayak for the conditions you intend to paddle in. Recreational kayaks are usually constructed of polyethylene, and are 10 to 12 feet long and 27 to 30 inches wide at the cockpit. They’re used mainly by beginners and other people who paddle primarily on lakes and slow moving streams. The most obvious advantage of recreational kayaks is that they’re quite a bit cheaper than touring ones. They are constructed from less expensive materials (i.e. polyethylene) and usually lack some of the features that make touring kayaks more maneuverable, like skags and rudders. The cheaper materials do come with a downside; recreational boats are heavier than touring kayaks, which are often constructed from carbon fiber or similarly lightweight composites. Recreational kayaks are also a couple inches wider than their touring counterparts, which give them a little extra stability. This is a nice feature not only for beginning paddlers, but also for anyone who’s planning to fish or take photographs from their boat and doesn’t want it rocking as they fumble around with equipment. That extra width does come with some disadvantages, though – the boat won’t be able to “cut through” strong currents and heavy winds as well as a narrower touring boat. The extra width also causes more drag, so you won’t be able to paddle as fast in a recreational kayak. And of course, it contributes to the heavier weight. Lastly, recreational kayaks are usually a foot or two shorter than touring kayaks. The shorter length makes them easier to turn, but it also diminishes their ability to track (paddle a straight line). Along with the slower speed, this could be a major downside for paddlers who want to take their kayaks on extended adventures. What is a Touring Kayak? 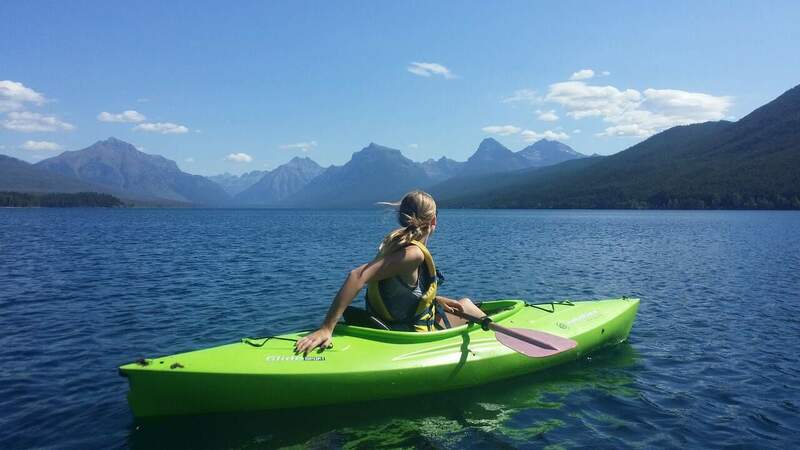 Touring kayaks are seen as an upgrade to recreational ones, as they’re longer, thinner, and packed with features that appeal to serious kayakers who want to paddle faster and farther. One of the biggest differences between touring and recreation kayaks is the hull design. Recreational boats are built to be stable and easy to use, while touring kayaks are designed to track well in fast currents and increase lift in rough water so they don’t get swamped by a wave. Flip both types of boats over, and you’ll see the touring kayak has a much more aggressive hull shape compared to the recreational kayak’s flatter profile. That hull design is a trade off though, providing speed at the expense of stability. As a result, touring kayaks can feel “tippy” for inexperienced paddlers. Touring kayaks are a couple feet longer, and this extra length significantly affects their handling. The longer the boat, the more difficult it is to turn, but also the easier it is to go in a straight line. Think of touring kayaks as having greater inertia than recreational kayaks; they resist changing course. That extra length also means more room to store gear, which you might need if you want to take the boat on an overnight camping trip. That extra space usually comes with sealed bulkheads, which keep your equipment dry and also limits the amount of water the kayak will take on if it capsizes. The most obvious market for recreational kayaks is anyone who isn’t interested in spending a lot of money. So long as you’re not taking the boat out into rough or fast moving water, the stable but less maneuverable hull design will probably suit you just fine. Recreational kayaks are also good for paddlers who are concerned about comfort; their larger cockpit will feel less claustrophobic and is advantageous for accessing stored items, like fishing gear, photography equipment, or perhaps just your lunch. If, on the other hand, you were more interested in a versatile boat with excellent handling and plenty of cargo space, a touring kayak would be a better choice. While it might seem more expensive, a good touring boat is a piece of equipment you’re likely to keep for a while. In the long run, it might even save you money. The choice between a recreational kayak and a touring kayak comes down to the environment you intend to use it in. Unfortunately, many of us like to use our boats in a variety of conditions, so it can be hard to choose one that’s good for all of them. But it’s best to choose the boat that will work in the worst conditions you intend to paddle; while a touring kayak might not be as comfortable on a glassy lake, a recreational boat could be downright dangerous in rough waters. I would like to add, recreational kayaks are really the only boat a beginner should buy, for several reasons. First, a beginner needs calm water and a wider, safer boat to get started on. Plus, since they are inexpensive, they can be sold for about what is paid for them if the person decides they won’t continue with it. The touring kayak comes only after the beginner gets their sea legs and wants to go the next step. After this, a touring boat would be a natural progression in the sport. It’s not a matter of chosing one over the other. One comes BEFORE the other. I kept my rec boat for less than a year. I thdn graduated up to 12’ and a 14’ touring boat. I learned how to balance myself, paddle, lean and get in/out during my first year on calm waters with the rec kayak.. After this was under my belt, I took on rougher water and greater distances and needed a narrower and faster boat.